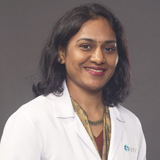 Dr. Sireesha graduated from Rangaraya Medical College, Kakinada, NTR University of Health Sciences, Andhra Pradesh, India she later completed her post-graduation in Obstetrics and Gynaecology from Guntur Medical College Guntur, NTR university of Health sciences Andhra Pradesh, India in 2005. She started her professional career as a Post Graduate Trainee in Government General Hospital, Guntur and later worked as Specialist in Obstetrics and Gynaecology department in Sigma Hospitals, Hyderabad. Dr. Sireesha also worked as Assistant Professor in Obstetrics and Gynaecology department in Andhra Pradesh before moving to Al Qassimi hospital, Sharjah as Specialist in Obstetrics and Gynaecology. Prior to joining NMC Specialty Hospital – Al Nahda, Dubai she was associated with Thumbay Hospital in Dubai. Dr. Sireesha’s special interest is in minimally invasive gynaecology as she has completed her comprehensive training in laparoscopy and hysteroscopy accredited by Indian College of Obstetricians and Gynecologists (ICOG) under Padma Shree awardee Dr. Manjula Anagani in Hyderabad, India in 2016. She is member of Federation of Obstetrics and Gynaecology in India (FOGSI), Indian Medical Association and is registered with Andhra Pradesh Medical Council. Dr. Sireesha has performed various gynaecological procedures and surgeries, expert in basic ultrasound scans and in managing normal and caesarean deliveries. Her areas of special interest are minimally invasive gynaecology, managing obstetrics emergency care and high risk obstetrics. Dr. Sireesha is fluent in English, Hindi, Telugu, Urdu and basic Arabic.